Buttons in the top right allow combining different variables to display only those crashes on the map. For the most part because of how zoomed out the map is, identifying meaning or significance is fairly limited. The exception to this is the speed limit of where the crash occurred. 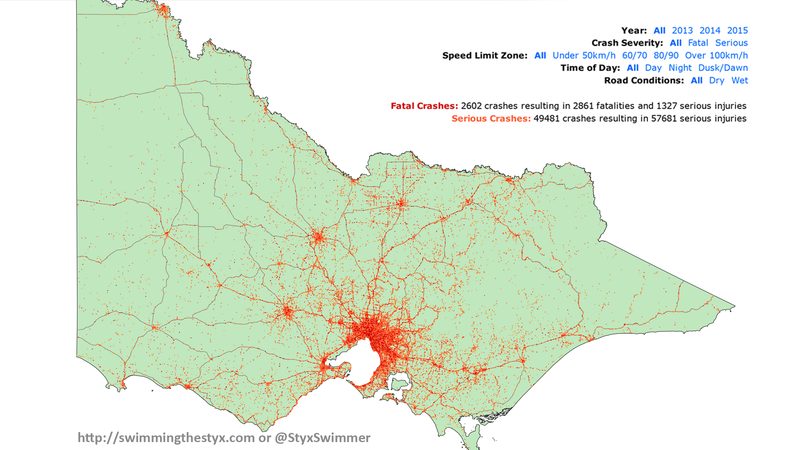 Speed limits do have the most drastic effect on how the visualisation looks. Not surprising but it is nonetheless cool, with lower speeds showing urban centers and higher speeds highlighting the arterial roads between them. An issue with the visualization in it’s current state is a lot of the points overlap (a heatmap would be more effective) and is slow to render, hence limiting the interactive version to 3 years of data. 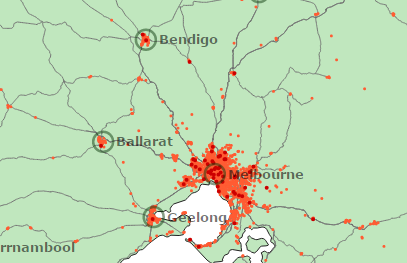 High resolution images below show 10 years worth of data for Victoria and Metropolitan Melbourne respectively. Click to embiggen. 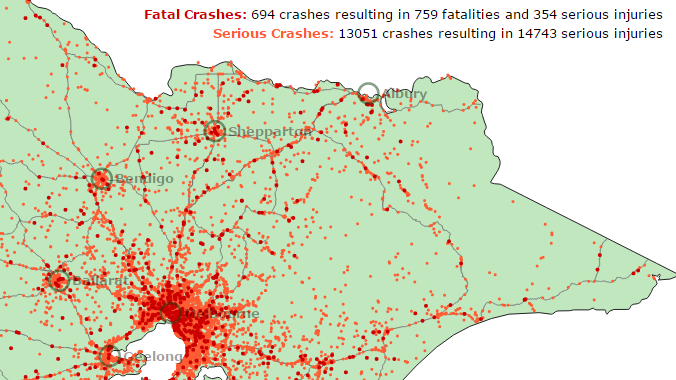 Crashes: VicRoads Crash Stats extracts here (general 5 year or detailed 10 years) with more info here. 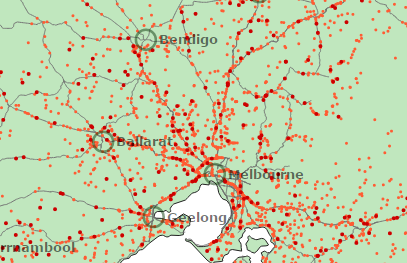 Kudos to VicRoads for making this available. It’s a deep dataset and there is a lot more in it than what is displayed on the visualisation above. Roads: VicRoads declared roads dataset is used here as a simple map of major roads in Victoria. 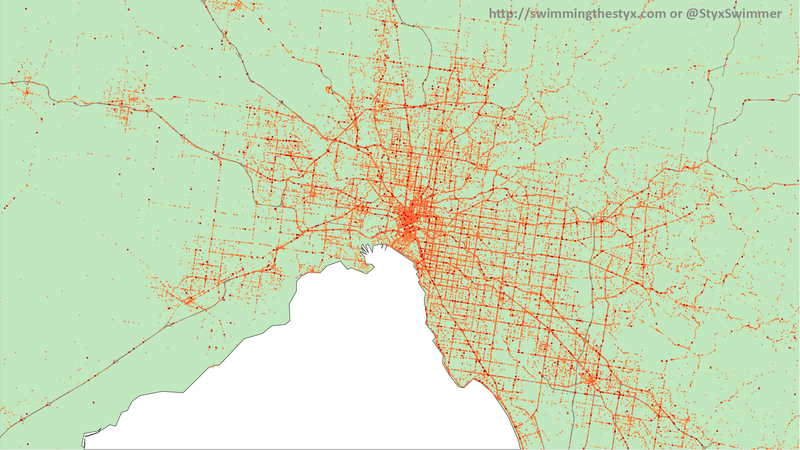 For more granular streets, or something nationwide OpenStreetMap is still your best bet. Victorian Border: This uses the Natural Earth 1:10m dataset, which is okay for this scale. If needing to zoom anymore than this would recommend switching to the ABS datasets (used in the high rez maps above) instead. A closer look at certain urban regions and maybe a suburb finder.